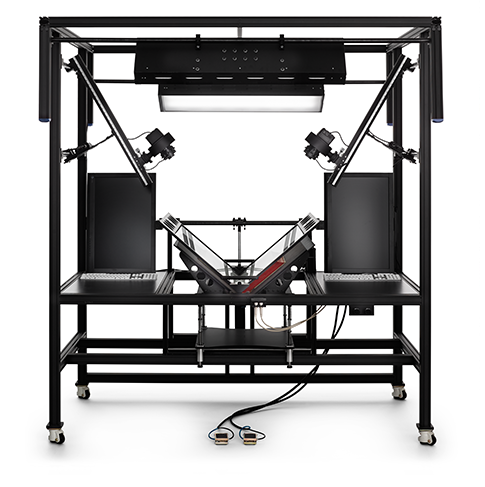 Built on the success of our DT RG3040 Reprographic System the DT BC100 Book Capture System is a dedicated book scanning system that will redefine the way bound materials are digitized. Scanning books with a flatbed or book scanner is slow and puts pressure on the bindings. Existing V-cradle solutions built around planetary scanners or general-purpose DSLRS cannot achieve consistent preservation-grade quality and struggle with reliability issues. The DT BC100 meets the high demands of cultural institutions by providing preservation-grade image quality, speed, and reliability needed to capture a wide variety of bound and loose materials – all while protecting their integrity. In addition to replacing flatbed and planetary scanners for the digitization of books, the DT BC100 is an excellent platform for the capture of loose works on paper, serials including newspapers, manuscripts, photos, drawings, and more. Dual Camera Book Capture System with incredible rates of capture much higher than book scanners. Up to 30 times faster than other book scanners. Capable of shooting bound and loose materials, including works on paper, serials including newspapers, loose manuscripts, photos, and drawings, etc. Digital Camera Heads meet preservation grade imaging standard including the FAGDI 4-star and METAMORFOZE-Strict guidelines. Software delivers preservation grade TIFFs, JPEGs, and PDFSs in RGB, grayscale, and CMYK modes. Open Source Raw and DNG also supported. The BC100 is the only true 48 bit system on the market. Its open platform design allows the camera and capture device to be upgraded. Durable design for years of uninterrupted, reliable use.